So it has been interesting seeing how my coop solar implementation plan is working out in reality compared to how I thought it would be. In my simplified thought process the sun runs and charges the Yeti box during the day and then during the night everything runs via AC inverted battery power. Well first of all I had to adjust the load downward by pulling the fans off the Yeti. With those connected the daytime load was close to 100 watts. That load would only increase at night when all of the infrared lights on the cameras are activated (something else I didn’t factor in). 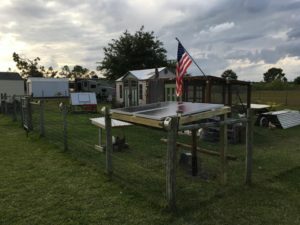 Tuesday was the first full day with the coop running off solar. It was a worst case scenario as it was overcast and raining a good portion of the day. When I checked it before the sun came up it showed the Yeti only had roughly two hours of run time remaining. However, even with the lack of sun the Yeti was able to keep power up all day with the solar power it was able to grab. However the problem was it only had enough to run the load, it had nothing extra to recharge the battery reserves. When I got home at night I checked and the run time remained at 2-3 hours. Obviously it would not make it through the night. So I went inside and grabbed the charge cord that allows me to plug the Yeti into conventional power. Doing so delivers 50 watts of input which is still slightly below my load. I worked out new logistics in my head where I will attach the power cord for the Yeti via a smart switch that I can turn on and off remotely as needed. Yes it requires me to be proactive in being aware of the weather/charge conditions but at least I would be able to inject juice into the box remotely if needed. However I discovered this morning that just plugging in the AC cord is not enough if it isn’t done early enough. When I woke up this morning I noticed the Xmas lights on the coop were on. They are on a light activated timer and will normally turn off after running 6 hours. The fact that they were on at 6:30 AM told me the box must have run out of juice overnight and then came back up after it got some more charge. Like I said, the AC input only inputs at a 50 watt rate, my load at night is around 65 watts so there is a slow drain going on all the time. So after a day there are probably a couple things I would have possibly done differently with the implementation. I would likely go with the next size up Yeti, the 1400WH model which would give me more room to play with. I also may have opted for the version that included wifi connectivity so you can monitor the box’s condition from anywhere. And honestly, I can see that eventually happening and I just move this Yeti 1000 to be used in another area of the household to supply solar power. Even with these hiccups I really like the project. It is a good feeling to be producing electrons from the sky and it’s an effort that I expect to expand over time. So last night after work I stopped and grabbed my traditional Tuesday DD coffee for the drive home. One of the things that has been tough with the Bell’s Palsy is drinking, especially from a standard DD cup which requires you to keep your lips pressed tightly around the small opening. I had multiple incidents of dribbling while drinking since the onset of this fun. To make it work I have to press my lips hard against the lid and then use a lot of suction, I sounded like a vacuum cleaner. So anyway as I was drinking my coffee on the drive it dawned on me that I was more or less drinking normally. No added pressure was needed and no slurping was heard. It felt like I had better control of my lower lip. For the first time since this started I actually had a degree of improvement instead of degradation. Later on I amazed myself when I was able to whistle for Elsa, another function I was not able to do a few days prior. I am hopeful that the symptoms continue to lessen. Maybe things will smooth out from the bottom of my face to the top.